There probably isn’t a working stiff alive who hasn’t, at one time or another, had a boss revenge fantasy. The 1980 movie, “9 to 5,” took that fancy to the ultimate extreme — and threw in female empowerment, to boot. Many people have a warm, fuzzy, nostalgic recollection of the film. But having just seen it again, despite its star-studded cast (Jane Fonda, Dolly Parton, Lily Tomlin, Dabney Coleman), it feels decidedly dated and kind of tone-deaf these days, and just too silly and far-fetched for words. Also, a lot less feminist than one might think. Dolly Parton and Patricia Resnick to the rescue. The musical adaptation of the movie (with a cunning, singable score by Parton) far exceeds its source (at least, in the 2013 revision currently on view at the Spreckels Theatre). Though Resnick co-wrote the original screenplay (with Colin Higgins), her book for the musical (which premiered on Broadway in 2009, and garnered four Tony Award nominations) is smarter, sharper and funnier — and it re-shapes some plot-points so they make more sense and serve the story better. She even tosses in a love interest for hyper-competent Violet (the Tomlin character), passed over for a managerial promotion because she’s a woman. Violet thinks she inadvertently poisoned and killed the misogynist, womanizing Mr. Hart. Then, in a twisted series of unlikely events, including a wild night of doobie-doing, the three disparate gals bond and band together, hold Hart hostage, and string him up while they update and expand the office, dramatically increasing productivity. These serve as stall techniques as they search for a way to nail him for embezzling from the company. San Diego Musical Theatre has gotten everything about the show right: the timeframe (and timing), the tone, the humor and the heart. 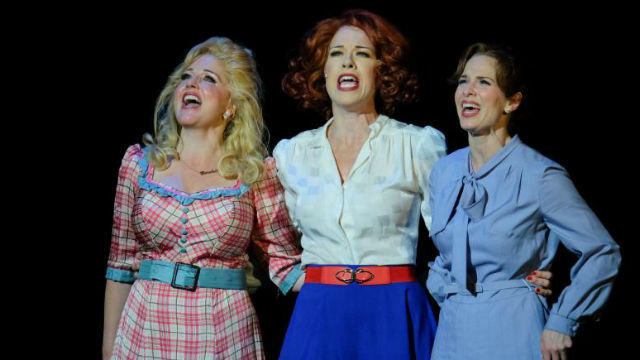 The three leads (Joy Yandell, Allison Spratt Pearce and Karyn Overstreet) are outstanding — powerhouse singers, able to create a compelling character and also move well (in the case of Yandell, also able to tap with aplomb). Triple-threats, all. Yandell is excellent as the unflappable single-mom Violet, who only freaks out when she thinks she’s murdered the boss. Spratt Pearce is delightful as naive Judy, who never worked a day in her life and is still trying to get over the fact that her husband dumped her for his 19-year-old secretary. Her character has the most profound arc and, as in her recent transformation from Louise to Gypsy Rose Lee in Cygnet Theatre’s “Gypsy,” it’s a joy to behold. who’s a straight-shooter – and a sharp-shooter – despite the boss telling everyone in the office he’s having an affair with her (he’s not; she’s totally devoted to her ever-lovin’ Longhorn husband). David Humphrey is hilarious as the sexist, tyrannical boss. He seems more clueless and bumbling than malevolent and hateful, but his physical comedy is a hoot, and we relish his comeuppance. As Roz, the zealous office spy who harbors her own fantasies about the boss (in a show-stopping number, “Heart to Hart”), Candi Milo packs a wallop — vocally and comedically. Chaz Feuerstine is solid as the sweet accountant, Joe, who pines for Violet (and is a fierce dancer as well) ; Wendy Waddell is amusing as the office drunk; and Paul Morgavo puts in a brief, strong appearance as Tinsworthy, the president of the board (a Col. Sander/Buffalo Bill lookalike). The rented costumes (coordinated by Janet Pitcher) and sets (including fun, colorful projections) are impressively fast-changing. The lighting (Christina J. Martin) and sound (Kevin Anthenill, also credited as projection tech) are first-rate. There’s something satisfying in this lightweight, laugh-filled musical. Call it revenge fantasy fulfilled — or plain old schadenfreude. It’s a melodic embodiment of “Stick it to the Man,” with women, for a change, brandishing the stick.